sign up as a team made of two to four people. Then after reading the designated books, they were taught about ‘Havruta-style debating’ through an orientation. Teams competed in the semi-finals with the winners from that round advancing to the finals. Additionally, e a c h t e a m w a s allowed to apply for an hour of further guidance before the competition. Not only did great prizes await competitors but it was made to be an academically beneficial experience for the participants to a great extent. 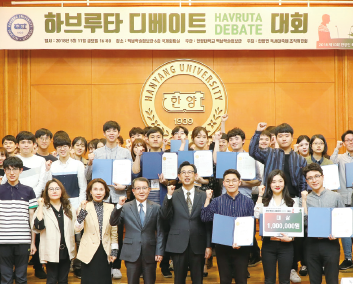 Havruta Debate Tournament is planned to take place once every year now in May, and the application process for the next competition will start around March 2019. The organizers of the Havruta Debate Tournament welcomes all students who have a love for books and reading.